I'm sure this will come off controversial, but here it goes. I spent some time in the California Desert Park of Anza Borrego last year with my family. We passed through the Badlands area of the park and I viewed it with foresight of what the possible potential could be if such areas are revitalized and enhanced with native plants for a more productive and climate changing environment. By productive, I'm not talking about economic productivity as in housing, agriculture, resorts, etc. But improving the environment would translate into a positive if life is enhanced on Earth for all life be it wildlife or human life. Sometimes well meaning Eco Movements and actistsinvolved in those programs often forget the human element. For them humans are not exceptional and it's all about the nature. But Humans are important too. We are all connected globally and what people do now to the earth effects the entire planet whether you choose to believe that or not. There is a whole giant world outside of your small bubble of an Activism Universe. But I'm also equally concerned about the numbers of countless native wildlife in various parts of the Earth who would benefit from such responsible human accomplished improvements. Dos Cabezas Spring with rich desert riparian habitat and wildlife in abundance. Here is an example of rich Desert Willow habitat and if I had used my brain last July, I would have also photographed some of the largest old growth Sugarbush Chaparral (Rhus ovata) that I have ever seen. The entire area of Sugarbush looked like large Scrub Oak woodland with ancient trunks & branches looking more like rugged bark of an oak than a mere lowly chaparral plant. Incredibly this area is often at temps of 100+ degrees Fahrenheit, and a plant community not often associated with desert environs. On an adjacent wash to the west, another chaparral species, Hollyleaf Cherry (Prunus iclicifolia) was found at the mouth of a Canyon Wash in the open desert of a Bajada or alluvial fan, proving that water was close to the surface here. Very large healthy looking shrub with zero signs of struggling to survive. Think people think !!! We go out to explore, not destroy & tear up. 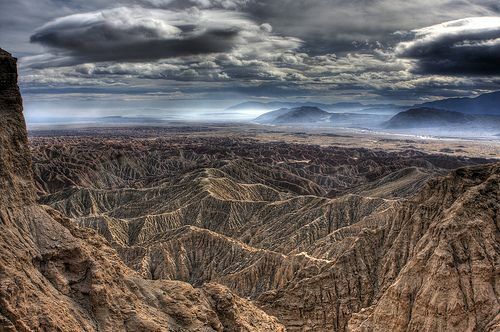 This is one of the Badlands viewpoint overlooks at Anza Borrego State Park. While there are some plants, it mostly is devoid of much vegetation at all. For many readers here around the world reading this, you will recognize such features in your countries. The badly eroded examples are everywhere and unfortunately with climate change, they are no doubt on the increase. While I personally love the natural geological features, there nevertheless has to be a limit the further creation of such regions through human stupidity, often accelerated through the misuse and abuse of science and technological advances. The above photo is the Carrizo Badlands Overlook facing east towards Imperial Valley where we next traveled down through that wash which is called Vallecito Creek. Oddly enough, the literature on this are says that the debris which makes up this are came from out of the Grand Canyon. Almost hard to believe until you look closer and appreciate that the geology trly is nothing like the granite structure of the mountains to the west behind this photographer. Of course it looks more like a dry wash than a creek, but don't let that fool you. There is quite a bit of water under these less than desirable looking garden soil geology as the 5 Palms Oasis attest to. Clearly these California Fan Palms (Washingtonia filifera) wouldn't exist here if water wasn't near the surface. This fan palm has no tap root like those of other desert plants like Mesquite or Paloverde. It's roots are much like that of common grasses for which there is a fibrous root system. You'd be surprised how many areas are like this, but without vegetation. These slot canyons end up providing habitat for native plants like Ironwood, Dune Mesquite, and Catsclaw Acacia. Believe it or not they can tap into a hydrological system and survive very well. Again, this soil which is sediment and debris origin materials can be unstable and there were several landslides. If planned properly, such geology could become more stable with the establishment of native Desert trees. In the upper photo with the Badlands overlook just above the Cactus there the gap in the crotch of the hills there where the dry wash runs ? Don't let the dryness of the wash or surrounding hills fool you though. This seemingly dry wash is Vallecito Creek for which we next went down through the wash headed east towards the direction of the Salton Sea and an important part of the San Felipe Creek watershed. We explored some of the many slot canyons which themselves can be dangerous for cave ins as we did see while hiking along some of the washes like the example above. Under these soils are great quantities of water. While it looks and is very dry on the surface, it has a wealth of water as evidence by the numerous California Fan Palm Groves dotted throughout this region. 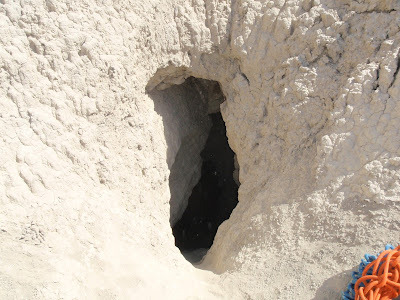 This picture above is on one of numerous mud caves in the Badlands region. Their has been tragic loss of life here such as that of weekend recreation mud cave explorer Guillermo Pino. There is a wealth of water under these regions, though it may not appear so from the surface. To give you an idea of the exact area, here is a map of the location. 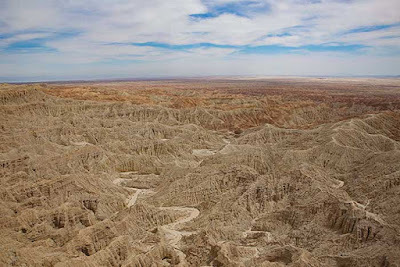 We are at the Carrizo Badlands Overlook in the photo at the top of this page. Okay, now we have a true picture of geological features called badlands. Those are those created by past catastrophic events which completely changed climate as is evidenced by the rearranged geology and there are many of the countless examples of human irresponsibly in caring for the land by either ignorant actions of all cultures (not just European ancestors who take a lot of blame by popular modern day Activist Leaders) but ALL cultures of humans who've ever come and gone and left their imperfect Human fingerprint stain on Earth. I've learned a lot about natural history from reading historical accounts of early pioneers and explorers and in particular the mention by them of the physical geographical characteristics of the land they viewed, travel and located at and the comparison of those locations to the present day sad reality which quite often does not reflect what was written. In particular the physical descriptions of trees and other plant life, though at the time these folks didn't realize how important such observations would later be as a means of education for habitat restoration. They're not alone since most researchers never consider to look back at these writings for clues. 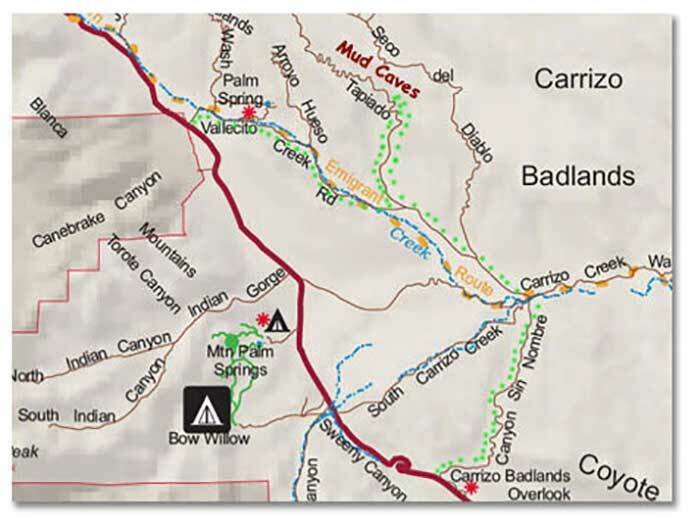 When I lived up in Anza CA on Table Mountain, the old Thomas Bros map indicate there was an older un-named spring behind my property up a dry wash in a canyon southeast of my property. I was curious and took a walk one day to look for it. Sure enough I found the old Spring which was apparently known to some early cattle rancher way back when, who build a concrete trough structure (like the one to the right) to collect water from the spring to water his cattle which were let loose out on the range running wild. 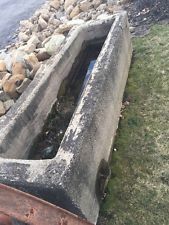 To be honest, most of these Springs I found were mainly seeps (as opposed to a true artesian spring) where pipes were insert into a hole excavated and filled with gravel and the pipe concentrated the water within the trough. The trough was dry, though the surrounding area was damp with moisture. 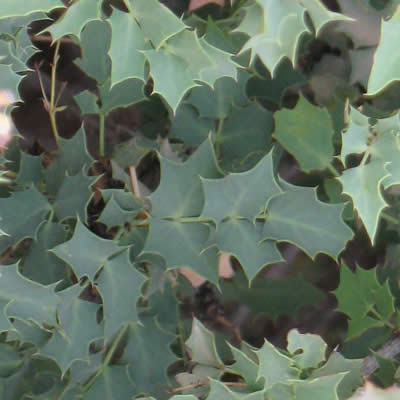 One plant that grew around there around the damp spring was a variety of Desert Mahonia which had it's characteristic grey-green foliage. But what went through my mind was where did all the water go ? Surely it was once a running spring which did the job of watering Cattle. I also remember talking to older ones within the mountain area and Hemet-San Jacinto Valley who told me of exploring such springs as a young person, but that many of these springs no longer existed. Then I remembered something I had read about Viktor Schauberger (1885 - 1958) Austrian Forester & Physicist who wrote about the phenomena of upwards movement of water facilitated by deep cover of pristine old growth forest or other vegetation cover which protected the spring from Sunlight. He believed Sunlight to be detrimental to a spring's health. He wrote of an occasion where a spring was encountered in an open meadow and was enclosed within the masonry cobblestone walls of a cistern with roof cover. Later this cover was removed and the stone walls take away and the Spring dried up. When they later rebuilt the cobblestone lined cistern and roof, the spring water returned to the surface and flowed out into a trough. I've already written about the ability of vegetation to preform a physical phenomena of Hydraulic Lift & redistribution and that of Hydraulic Descent. ** (see footnotes below) So considering this I went in search for clues of what may have once existed there in the way of plant community habitat. Sure enough I did not have to go to far. Dry washes on both sides of this canyon which were for the most part themselves dry and rocky held clues in the way of dead tree stumps of Coulter and Jeffrey Pine which actually still exist around there, just not in this part of the canyon which forms some of the headwaters source of Hamilton Creek. Many dead and rotted logs laying around on the mountainside, some still sticking up out of the Earth and frozen in time by some past fire charring event. So there was at one time deeper forest cover here and an indication of perhaps some wetter climate times as I found some Incense Cedar logs (not exactly known for being a rapid decomposing wood) around this area as well. When I first moved to this area in 1981, I was privileged to speak with descended members of the Ford, Cary, Bahrman and other pioneering homestead families. These people at that time were in their late 80s or early 90s. They had a wealth of knowledge about the natural world when they were younger, though I doubt they truly understood just how important. However a few key questions and well tuned memory jogging references brought back memories of what the landscape looked like at the turn of the century. I had known for some time that most people in those early days made their living at cattle ranching. And what do Cattle eat, they eat grasses. So trees would have been looked upon as a hindrance to the production of grasses which makes cattle grow and that is what every one of them confirmed to me. I asked the question about the eastern and northern Anza Valley because on the old maps and even in some of the present names-places, the words like - "Old forest Road" or "Burnt Valley" makes one wonder about their origins of those words/terms/names. Here's a link from an article from Pacific Standard Magazine on Chaparral NOT being the fault behind Mega-fires. You'll recognize references to the California Chaparral Institute and it's Director Richard Halsey. "During the 19th century and half of the 20th, chaparral - found along the Pacific Coast and western edge of the Sierra Nevada mountain range from Oregon's Rouge River Valley to Baja California's San Pedro Martir - was considered a wasted landscape and worthless. Ranchers set it on fire to get rid of it and planted grass for livestock. As more and more people moved to the great scrublands, chaparral was branded an ugly fire hazard and wildfires demonized as a hellish occurrence." Sure enough ALL of those elderly folks said the almost exact word for word thing about the plant community which once existed and deliberately removed. Though the above article was about chaparral, these pioneers told me that huge old growth Oak Forests interspersed with pine trees were what hindered the grassland habitat and they cut the trees, used or sold what lumber they could, burned the slash and planted grasses to replaced what was considered at that time worthless. No doubt chaparral was intermingled with these trees and forests as it is all a part of the same plant community in one way or another. They ultimate agreed that all of northern, eastern Anza Valley and Table Mountain along with Burnt Valley was heavily forested. Wow, what a difference if any of you could see it today. Of course maybe the question also should be "What causes droughts ?" So climate and weather eventually changed (which at first would have been localized) as any newer seedlings were eradicated manually or the countless animals moved up there did it themselves. Of course such ignorant irresponsible actions have taken control around our entire globe and anyone want to guess why we have major Macro-Climate Change ? I know, it's a hoax !!! Okay, take a look now at another recent finding this year 2012 and reported on from Australia and the important phenomena found from specifically DEEP ROOTED tree species and the interesting mechanical functions they perform within any forest ecology. Queensland University of Technology - Brisbane Australia - "Electricity From Trees"
"Plants have long been known as the lungs of the earth, but a new finding has found they may also play a role in electrifying the atmosphere." "Scientists have long-suspected an association between trees and electricity but researchers from Queensland University of Technology (QUT) think they may have finally discovered the link." Well My My My My My - So Earth's Vegetation (especially old growth deep rooted vegetation) really does have the ability to not only electrify the atmosphere, but influence things like cloud formation, rainfall and possibly recharging Earth's Electromagnetic Field as the United Nations Environmental website admitted, but was vague on. "They found the positive and negative ion concentrations in the air were twice as high in heavily wooded areas than in open grassy areas, such as parks." So let's see if we have this correct. Heavily Wooded areas (Old Growth Plant Communities of many types or kinds) will have higher concentrations of these ions and aerosols than in open lower vegetative areas and probably almost ZERO in moonscaped areas created by humans through ignorant mistaken error, selfishness and greed ? Hmmmm? Now they also touch on Radon dangers from this phenomena, but seriously, this isn't even close to being as dangerous as all the Bad Science Rubbish that has been invented by humans for consumerism exploitation. This Scientists from Aussieland are pollution and other atmosphere researchers and I understand need to look at this, but clearly in their studies, they weren't originally looking for this. It was an amazing gem of an accident. "Dr Jayaratne, who is also a member of QUT's Institute of Health and Biomedical Innovation (IHBI), said that natural ions in the air were mainly created by ionisation due to two processes - radiation from the trace gas radon in air and cosmic radiation from space." Radon is a by-product of the radioactive decay of radium which is present in minute quantities in rocks and is continually exhaled by the ground. "Because radium is found in rocks and radon is soluble in water, ground water is particularly rich in radon," he said. "Trees act as radon pumps, bringing the gas to the surface and releasing it to the atmosphere through transpiration - a process where water absorbed by the root system is evaporated into the atmosphere from leaves. This is especially prevalent for trees with deep root systems, such as eucalypts." On a separate issue, let's take the depletion of what is termed Fossil Water (Primary Water) found in deep aquifers that most vegetation with the exception of some deeper rooted foundational ecosystem Trees or Shrubs are unable to tap into. Many many deep underground aquifers are being depleted by irresponsible agricultural usage. Perhaps some usage is for filling city needs in many places. What is it that conducts electricity better than any other element in the ground - answer "Water"is it not ? This was highlighted by researchers who just a couple years ago looking at the potential of Earth's Mantle interior for holding up to six times the amount of water than the total water from all oceans, seas, lakes and river systems combined on the surface of the earth. The key was finding conductivity and it was determined that water was not only the reason for this deep mantle conductivity, but also facilitates movement of the liquid mantle materials and molten properties of magma and so forth. The Earth has an iron core. This natural machine produces magnetism and other conductivity. This magnetism emerges from the Poles. Water re-works it's way gradually to the surface to be recycled all over again. Some of this water and minerals are taken up by deeply rooted trees and shrubs, redistributed even to other plants and as a whole emit negative ions and aerosols into the Earth's atmosphere which creates a moderating of Earth's various climate cycles as well as possibly recharging Earth's electromagnetic field. But again this comes piece meal from all various specialists in specific fields with very few putting the entire puzzle together. With the exception of this world's irresponsible militaries. See the footnotes. - Seriously see the footnotes, there are many who have known all this all along. Here's a further reading of Dr Jayaratne's research in the actual paper's abstract. Very enlightening. The role of vegetation in enhancing radon concentration and ion production in the atmosphere. "The role of ions in the production of atmospheric particles has gained wide interest due to their profound impact on climate. Away from anthropogenic sources, molecules are ionized by alpha radiation from radon exhaled from the ground and cosmic gamma radiation from space. These molecular ions quickly form into ‘cluster ions’, typically smaller than about 1.5 nm. Using our measurements and the published literature, we present evidence to show that cluster ion concentrations in forest areas are consistently higher than outside. Since alpha radiation cannot penetrate more than a few centimetres of soil, radon present deep in the ground cannot directly contribute to the measured cluster ion concentrations. We propose an additional mechanism whereby radon, which is water soluble, is brought up by trees and plants through the uptake of groundwater and released into the atmosphere by transpiration. We estimate that, in a forest comprising eucalyptus trees spaced 4m apart, approximately 28% of the radon in the air may be released by transpiration. Considering that 24% of the earth’s land area is still covered in forests; these findings have potentially important implications for atmospheric aerosol formation and climate." Okay back to Barren Wasteland conversion in any desert circumstance. This goes for places in Australia, Africa, Asia, North & South America and maybe as far as the poles, yes both poles. (Remember, when Earth was at it's peak vegetative state, the Poles as we know them today didn't exist) When you look at any landscape like the example above, such places do get rain periodically. The components for why such rain falls on these landscapes were created elsewhere. This is how rainfall works in most places that have deserts, though there are variables. Take the mighty Sahara where many places never get rain. For the most part we are talking about runoff with very little soaking in. At best maybe an inch or two of soaking in but mostly runoff to lower reaches. In Arizona history for example, I was reading Marshall Trimble's book "Roadside History of Arizona" (* see footnote) and I had read about the town of Bowie in the southwest portion of the state. His historical account of the San Simon River flowing through Bowie, explained how it was an area where trappers harvested Sonoran Beaver. However when I traveled through Bowie once and stopped there, that so-called river was nothing more than a dry wash. I didn't see any signs of water let alone potential for Beaver habitat. What I further discovered later is that the early Cattle Barons (and these people were greatly selfish greedy & stupid) of the old west brought in 10s of 1000s of Cattle more than the land could handle and it was grazed to the soil. Rains came and washed the top soil away revealing the more sterile subsoils. (badlands geology). Such soil almost becomes fossilized at that point and even gentle rains can flash flood when they do come. So it appears that the land reclamation ultimate goal is to not necessarily stop raindrops when they fall to earth and make their way to the seas, but slow them way down before hand. Let every living thing get it's use of it before it is gone. This calls first for some mechanical intervention, whether by machinery or manually by hand. Artificially replicating what nature does in the wild. One of the lesson we can take is from nature itself. A lot of desert badlands are massive areas of flood water sedimentation created by some historical catastrophic event and with possibly a great amount of uplift thereafter. 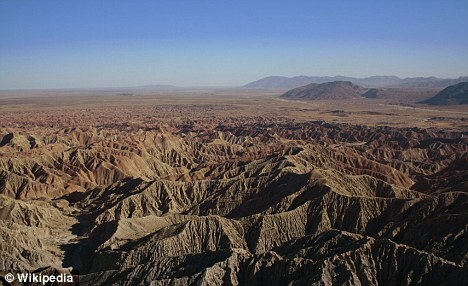 Borrego Badlands are said to be Colorado River deposits. If you know anything about the Colorado river, it's almost a hundred miles away, so it can sound a bit far fetch without a massive extinct event in the equation. But in many areas of hydrological disasters there are patterns in the geology of something called lake terracing. Where waves lap the shoreline and create differing levels of terrace or steppes. Certainly this pattern could also be enhanced by utilizing the creation of berms or swales. 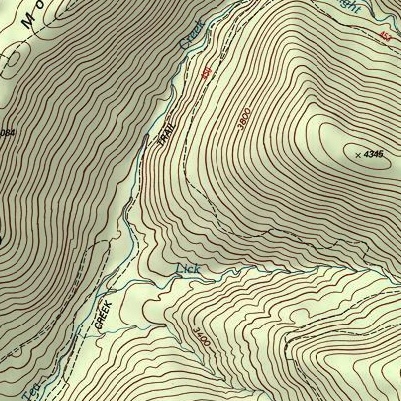 ( See Footnote) Now take a look at the Topo Map below. This is not an actual place of importance, that is irrelevant. It's an illustrative example I'm merely using of an extreme approach to rearranging such a degraded site as a Badlands formation in any country to a restored plant community reclamation outcome. Pretend for a moment that this was once Badlands geography. You now mechanically created an organized structured pattern in the soil to slow down water and allow vegetation to get a foothold. Yes of course this is a lot of work and may appear extreme, but we live in extreme times. Humans have brought this planet to it's knees in more ways than one by their extreme irresponsible behavior. Don't expect Governments, Big Business (bad science) or any other powerful entity to take any of this serious. This is mainly for an individual or group that actually cares and desperately needs to turn things around quickly. Such terracing examples are found on the Canary Islands where rainfall is the only source of fresh water and slowed down movement becomes a vital strategy. I've already started a Mesquite & other Pea Family Seed germination and container growing experiment here at home which also has it's own page on the left hand side of this site. ( See Footnote) My idea is to allow say a Mesquite, Acacia or Paloverde develop as it would in nature by the creation of the all important tap root system. Seriously, this is what the genetic instructions demand if the tree is going to survive and be productive in any harsh hot environment. Conventional Nursery containers like 1 gallon don't allow for this taproot construction, they hinder it. Such containers are fine for retail/wholesale Nurseries selling to public for urban landscape usage where people will continually baby the plant, but they don't work well in a remote habitat project situations. What I've come up with and I'll create another single page and post it over on the left side of this site, is a long tubular shaped sock around two inch diameter made of loosely woven Jute Burlap at any length desired to be grown inside of a plastic pipe twice the width and with air holes to allow ventilation and air pruning to force quick downwards growth. The length I've chosen for my experiment purposes is exactly 1 meter in length. Longer sizes could be used and I would recommend this for a few planting placements and I'll explain why later. The meter length is perfect for the illustration. This could be undertaken any time of year if a greenhouse is available. 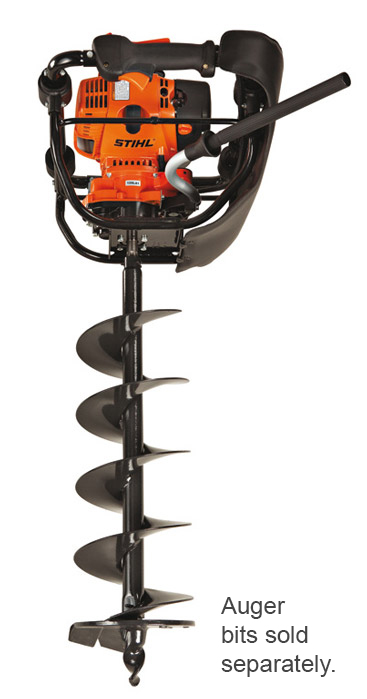 This would allow for fresh germination and out-planting at the right time. So how do I plant these ? I gave some illustration in my post on the UCSD Mesquite Dune Remote Planting Project. (See Footnote) I like some things they did and disagreed with other things that I thought could be improved upon. On special note here let me explain what I would consider the ideal Jute Sock system potting media, I'd probably use vermiculite or pearlite for aeration and I would also add these to the native soil from the site to be planted so as to introduce the seedling to the chemical signature of the soil it will be permanently planted in. Now as far as a mechanical means of actually drilling the hole, this could be manually done or machine operated, depending on the circumstance and physical make up of the terrain. Some things may be impossible for much deep deep drilling or hole boring. I've already mentioned some things I liked with regards the irrigation system used on the remote planting site. I have used this same exact method back in the late 1970s early 1980s on the Rattlesnake Mountain project, some remnants of which should still be there. The idea is to get water deep into the earth's subsoil layers by several feet and train the plants to grow there as opposed to surface irrigation or even a drip system which creates lazy surface roots. Drip system is like keeping the project on lengthy year after year life support and that is not the idea in rapid project establishment with very little effort. Chaparral plants in the wild utilize deep subsurface moisture for summer maintenance and survival. Surface irrigation allows for succulent growth which brings on diseases so common in urban landscapes but normally absent in the wild. Even Professor Todd Dawson of Dawson's Lab discovered plants along streamside habitats did NOT access the majority of their hydrating from surface streamside waters but rather very deep subsoil layers. There clearly must be a reason for this and it should be replicated as closely as possible. Isotope studies proved the origin of those waters. The image to the left here is an example of how easily promoting of water can be into deeper subsoil layers of the earth where sun and wind cannot touch it. Only water loss will be through evapotranspiration from the plant itself. This beautiful illustration of being able to get water deep down below the Mesquite , Paloverde or Acacia Tree's taproot is imperative if long term survival is to take place. There needs to be a view of healthy ecosystem underground root & mycorrhizal infrastructures as a brilliant piece of engineering to be replicated in any restoration project. It's irrelevant at this point as to how such things occur or once occurred out in Nature in the first place. The fact is such systems have worked fine for countless thousands of years and no amount of artificial improvements will replace the original that has performed beautifully until humans stepped in. Finally no project would be successful without an mycorrhizal inoculum program. These beneficial bacteria and fungi are necessary for plant establishment and survival. Even all the way down the hole's bottom to ensure complete hydration of the plants. You could use a strategy of proper placement of long 8 or ten foot Mesquite seedlings into much deeper hole drilling possibly even to water tables. Such plants would quickly develop hydraulic lifting and redistributing abilities much earlier than normal to nurse shallower rooted plants along. A map of trees from Voltree beautifully illustrate the strategy, although the never purposed it for this. I'm merely providing a visual here. Purely as an example of planting deeper trees, consider the trees marked in orange as carefully located deeper plants to benefit other meter deep planted trees around them. This is not exact or perfect, but clearly someone could come along and improve upon it. Merely look upon this graph or chart as a proposal. If some trees are able to tap deep enough into the water table, then their incorporating the hydraulic lift mechanism and redistributing water to all the other plants through the grid will be the ultimate goal. For the moment, this is mostly what I had to share. It is clear that researchers are finding out more and more about how brilliantly put together and complex our natural world really is. It's a giant living mechanism that takes care of us and makes life possible. Ignore the symptoms and eventually it will be too late to turn things around. Some areas already have a point of no return. Bad Science has created the problems our natural world faces. Most global Warming proponents focus purely on symptoms as opposed to roots causes. Not surprising since medical science does likewise. It seems if there is no profit to be obtain it's considered NOT a viable option. In keeping with the "Earth's Internet" theme, I'm hoping more and more of this is sinking in and making sense. Understand I've had 30 years to observe and explore things I've had suspicion of existing in real life. Much of my understanding and proving came from practical application to see if conclusions were true. Science today is merely backing some of my inferences over the years. Sadly though I wonder if anyone is paying attention. For the idealists folks championing ecological causes, start getting a clue and educate yourself on the basic fundamentals. That will go much further and gain more respect than running with mere emotion. Nothing wrong with emotions, but in this case more substance is necessary if your personal favourite Activism is to be taken seriously!!! Stay tuned for further pages & posts as I'll have a part two which is already in the Draft works. Will Croft Barnes (1858-1937) first came to Arizona as a cavalryman and went on to become a rancher, state legislator, and conservationist. From 1905 to 1935, his travels throughout the state, largely on horseback, enabled him to gather the anecdotes and geographical information that came to constitute Arizona Place Names. For this first toponymic encyclopedia of Arizona, Barnes compiled information from published histories, federal and state government documents, and reminiscences of "old timers, Indians, Mexicans, cowboys, sheep-herders, historians, any and everybody who had a story to tell as to the origin and meaning of Arizona names." The result is a book chock full of oddments, humor, and now-forgotten lore, which belongs on the night table as well as in the glove compartment. 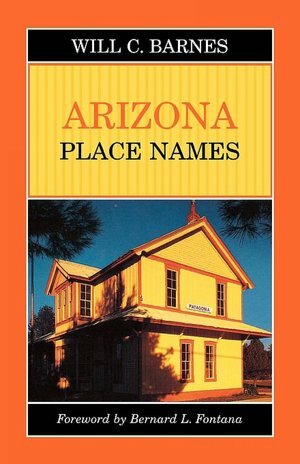 Barnes' original Arizona Place Names has become a book lover's favorite and is much in demand. The University of Arizona Press is pleased to reissue this classic of Arizoniana, which remains as useful and timeless as it was more than half a century ago. Marshall Trimball (Arizona Gen. William Tecumseh Sherman visited Arizona in the summer of 1880. A promoter made the mistake of asking him what he thought of the place. Too damn hot and dry, Sherman declared. All she needs, the promoter said soothingly, is less heat, more water, and a few good citizens. Hunh, Sherman said. That s all hell needs. (From Roadside History of Arizona, The last of the lower forty-eight to gain statehood in 1912, Arizona now tops lists of the best places to live and visit. For the history behind that reversal, join Arizona s official state historian and beloved ranconteur Marshall Trimble on the state s highways and byways. Along the way meet Fathers Eusebio Kino and Francisco Garces, Non-Assessable Smith, Ned Beale and his camels, Nellie Bush and her steamboats, Great Western Sarah Bowman, and the Navajo code talkers. Find out why Why s called Why; where Arizona s Civil War battlefields are; what happens at the Zuni River Reservation, where no Zuni live; and the possible whereabouts of the Lost Six-Shooter Mine. From Fredonia to Naco, Oatman to Show Low, Ganado to the London Bridge, visitors, newcomers, and old-timers alike will delight in this classic of history and travel, originally published in 1986, now updated, expanded, and redesigned. Im interested in your sock-tainer idea. It's actually pretty kool. I really didn't know what to name it other than describing what the components were involved. Maybe someone will create a newer name or even improve upon it. One can only hope. Should be accomplished here within another few weeks. wow, its really funny. Masanobu Fukuoka, he long held the idea that if we planted trees, it would bring the rains, and, everywhere he went, he would say thing. replant this area, green this dessert, you will bring the rains back. He was a simple man, but, held wisdom, maybe you could say a 'philosopher'. See, the funny thing there, he held an intuitive knowledge, he didn't have to read that information, he just knew it was the truth. Interestingly related to that paper published on science and philosophy you linked. I don't think philosophy is 'gone' its just not distributed or given the attention it once did.. maybe because some truths are in them certain parties would rather not have released. :D anywho, off topic, desertification is an all around process, take away the soil, remove natures ability to grow flora, and then remove ability to cycle water.. interesting thing that. Believe it or not, I actually upset some folks when I talk about taking wastelands and regenerating them into something productive. They get the idea I'm speaking of something in the way of Industrial Agriculture, which is certainly not the case. This is more of a re-creation of what once was. Creating a system of biological earth climate creation, regulation and maintenance mechanisms. Unfortunately most of the Science-Based junk solutions I see out there never address the irresponsible behavior, but some cheezy fix-it-pill approach to address symptoms, not causes. Treating symptoms creates more wealth. Ultimately that was where things went wrong in the first place.